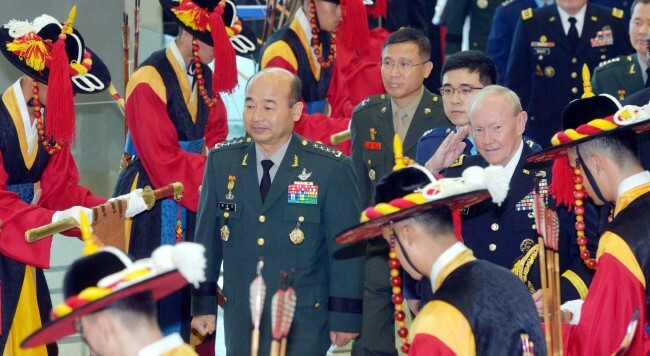 Joint Chiefs of Staff Chairman Gen. Jung Seung-jo and his U.S. counterpart Martin Dempsey inspect an honor guard at the JCS headquarters in Seoul on Monday before opening the annual Military Committee Meeting. This is the sixth and last in a series of articles to mark the 60th anniversary of the South Korea-U.S. alliance. ― Ed. Borne of the devastating Korean War 60 years ago, the South Korea-U.S. alliance is now exploring broader roles for ensuring security and prosperity beyond the peninsula. Experts say the partnership will continue to focus on deterring North Korea’s nuclear and conventional threats, while pushing for a wider range of missions such as protecting democracy and fighting piracy, terrorism and poverty around the world. “During the Cold War, the alliance’s main roles were to deter North Korean aggression; win a war if deterrence fails; and fend off Soviet expansion. But its roles have faced adjustments in line with the changing security landscape,” said Nam Chang-hee, international politics professor at Inha University. For the future of their partnership, the allies’ close cooperation is of great importance as Seoul grapples with increasing military threats from the communist neighbor and seeks greater autonomy in the alliance, while Washington falters under deepening financial woes. Observers also raise the hope that the alliance will become a building block of a collective security mechanism, which has yet to be seen in East Asia amid an emerging rivalry between the U.S. and China as well as the region’s historical and territorial antagonisms. With Pyongyang showing no willingness to dismantle its nuclear arms and missiles, the alliance’s main focus will continue to be on deterrence against the communist state, analysts say. For the growing nuclear threats, the allies have been consulting over how the U.S. would provide the South with its stated “extended deterrence,” whose concrete procedures in case of a peninsular contingency have yet to be spelled out. Extended deterrence refers to Washington’s stated commitment to deterring military threats to its key Asian ally of South Korea, including those from nuclear weapons and other weapons of mass destruction. “North Korea poses major threats to the ROK (Republic of Korea) and those are unlikely to either go away or be significantly reduced in the coming years,” Bruce Bennett, a senior defense analyst at the RAND Corporation, told The Korea Herald. Bennett pointed out the alliance’s handling of Pyongyang’s nuclear adventurism is also crucial for U.S. security interests. “The North has been developing nuclear weapons and long-range missiles to deliver them, apparently hoping someday to be able to directly threaten the U.S. with nuclear war,” he said. Amid increasing nuclear threats from the regime in Pyongyang, Seoul has requested Washington to reconsider the timing of the transfer of wartime operational control, currently slated for December 2015. During the allies’ annual Security Consultative Meeting in Seoul on Wednesday, Defense Minister Kim Kwan-jin and his U.S. counterpart Chuck Hagel are to discuss the OPCON transfer. The two sides share the need for more consultations over the issue, which involves not only a military aspect, but also political and diplomatic considerations. During the Cold War, the South Korea-U.S. alliance had served as a collective defense system, not only protecting Seoul from the North’s aggression but also guaranteeing Washington’s strategic interests by containing communism and maintaining a balance of power in East Asia. But after the collapse of the Soviet Union in 1991 and with a relatively stable security situation on the peninsula, the allies have sought to expand the roles of their partnership to more comprehensive causes for regional and global stability. Apart from its foremost role of peninsular defense, the alliance is now seeking joint responses to a wider range of challenges, such as terrorism, nuclear proliferation, use of weapons of mass destruction, human rights abuses, poverty and climate change. Under the alliance, Seoul has sent troops to Iraq and Afghanistan to help support the U.S.-led global campaign against terrorism, and also to South Sudan to help rebuild the civil war-ravaged African state. “The U.S. and the ROK are partners in achieving international security. In areas like the coast of East Africa where piracy has become a serious threat, the ROK and U.S. military forces have worked together, along with other international partners to reduce the threats to each of our interests,” said Bennett of the RAND Corporation. Some experts predict that the alliance could learn from the evolvement of the North Atlantic Treaty Organization, which has adapted well to the changing security landscape after the Cold War and turned into a collective security institution in Europe. One destabilizing factor in the alliance’s efforts to help forge a collective security entity in East Asia could be the rise of China, which has strengthened its military might based on growing economic clout and aggressively pursued maritime interests in festering disputes with neighboring states, mostly in the South China Sea. Professor Nam of Inha University said the alliance in tandem with other regional partners will be able to help ensure regional stability that could be challenged by an increasingly assertive China. “China is now at a crossroads between becoming a responsible stakeholder in Northeast Asia and becoming a Sino-centric revisionist that would challenge the status quo,” said Nam. Skepticism, however, still lingers over efforts toward collective security due to an intensifying Sino-U.S. rivalry, and regional historical and territorial animosities. Experts say the current circumstances require the allies to mobilize their creativity and promote confidence-building among regional players. “In East Asia, there are mostly bilateral alliances, such as the Korea-U.S. alliance and the U.S.-Japan alliance. We can move toward collective security by connecting those separate alliances, involving confidence-building institutions such as the ASEAN Regional Forum and promoting compatibility among them,” said Kim Tae-hyun, a diplomacy expert at Chung-Ang University. As the alliance faces shifts in tune with changing contours of security, analysts say the South Korean military should also alter itself to better tackle an array of regional and global security threats. When Seoul prepares to retake wartime operational control, though it wants a delay in the transfer, it needs to carry out a more effective reform of its armed forces to enhance its commanding structure and inter-service cooperation. The South has pushed for defense reform, most recently in the wake of the North’s torpedo attack on the corvette Cheonan in 2010 that killed 46 sailors. But the reform endeavors fizzled out due to inter-service rivalries, and political and budgetary variables. “As the U.S. reconfigures its strategic presence on the peninsula to support regional or even global missions rather than addressing traditional static peninsular defense, the ROK forces are required to increase their qualitative combat capabilities and assume greater autonomy and responsibility in defense of the country,” said Michael Raska, research fellow at the S. Rajaratnam School of International Studies, Nanyang Technological University. “In terms of ‘software,’ however, South Korea’s strategic thinking and culture has been relatively unchanged ― entrenched in the collective defense mechanisms of the U.S.-ROK alliance,” he said.